Firms survive when they find enough work to cover their expenses and generate a little profit. But firms thrive when they build enduring client relationships that continue to produce revenue and profit for the long haul. Ever notice how most business development efforts seem driven by a survivalist mentality? They're mostly transactional, focused on winning projects rather than clients. And as those projects are being completed, there's the constant push to find more of them. Meanwhile, the firm's ongoing clients provide the stable base needed to create a sustainable business. Business relationship. As professional service providers, our foremost responsibility is helping our clients be successful. The true value of your projects is how well they deliver business results. Unfortunately, technical professionals are often prone to neglecting the business performance aspect of their designs and solutions. One of the best ways to differentiate your A/E firm in the competition for clients is to demonstrate a keen understanding of the client's business and how your services will help achieve business outcomes. Divorced from the client's strategic needs, your services are likely to be viewed as a commodity. Commodity purchasers are much less likely to form the long-term relationships with service providers that you desire. Working relationship. This involves how well the two parties work together, another aspect of client relationships that gets too little attention. The working relationship defines the client experience, which surveys suggest constitutes half of the perceived value that you deliver to clients. Yet the working relationship is seldom mentioned in sales conversations or in proposals. Most firms lack any kind of standards for delivering great client experiences, nor do they regularly solicit feedback from clients on how they're doing. There are three critical steps to excelling at the working relationship: (1) benchmarking the client's expectations, (2) developing processes and standards for meeting those expectations, and (3) getting feedback on your performance. Do these three things and your firm will be in rare company. 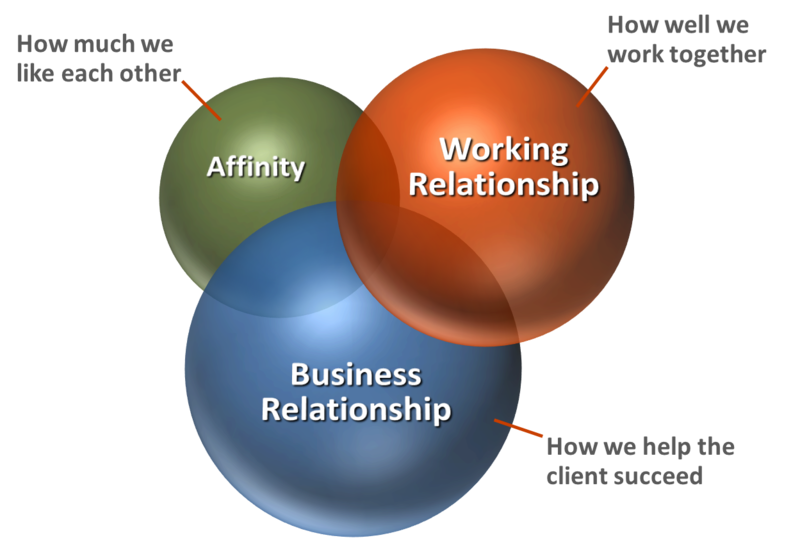 Affinity is how much you and the client like each other. Friendship with clients is a wonderful thing, but it's overrated. You can have a very productive relationship with a client who is not a friend if you deliver business value and a great experience. When I speak of friendship, I'm talking about a relationship where simply spending time together is valued. There is a personal caring for each other, a natural attraction, and common interests. In business, the term friend is commonly too broadly applied. Some seem to call everyone they know a friend. Others consider any client they get along with a friend. But getting along is a result of a strong working relationship, not necessarily a friendship. Why are these distinctions important? I've seen too many friendships in business strained by the failure to deliver business results or tend to the working relationship. There are still sellers in our business who think that making friends is more important than meeting business needs. Too many firms think that quality technical work is all that really matters, without giving proper regard to the client experience. And our industry's neglect in linking our work to business outcomes is a significant factor in the commoditization of our services. If your firm is serious about building more profitable, long-term client relationships, you'll want to avoid these common mistakes. Great client relationships result from helping clients succeed in their business or mission, delivering great client experiences, and—if the opportunity arises—being a good friend.